All pet owners have been there or will be, sooner or later. This page is designed to help you clean up the mess, so that the spot no longer smells, and you don’t have to suffer a repeat performance. While we are specifically discussing feline urine, the same principles apply to canine or human urine as well. Cat pee smells stronger than other animals’ urine because they evolved in a desert environment to be extremely efficient with water, so their kidneys extract more of it, concentrating the urine. It is important to ensure that the urine is completely removed, beyond what you can smell, because cats or dogs will continue to return to a spot where they once marked. Cat urine is made of urea, creatine, uric acid, sodium chloride and other electrolytes, and various substances removed from the bloodstream by the kidneys for disposal. Male cats’ urine also contains the pheromone felinine, which breaks down to an especially pungent substance. 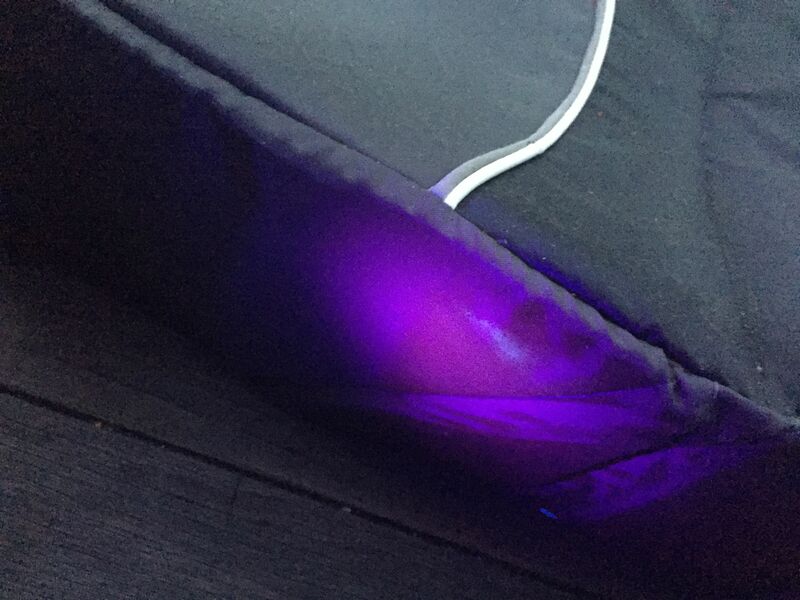 Your LED UV black light is a useful tool as any urine contains phosphorus and blood proteins, both of which will glow strongly when fresh in the black light. 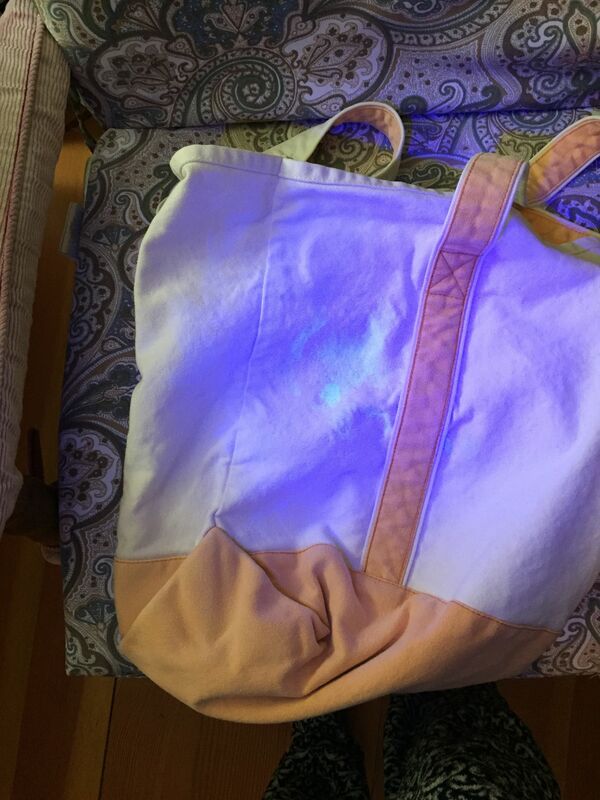 Even year-old stains, not visible at all to the naked eye, will show up in the black light, though they’ll be fainter. You will use the lamp to find all the spots, and to validate that you have completely removed the stain when you think you are done. 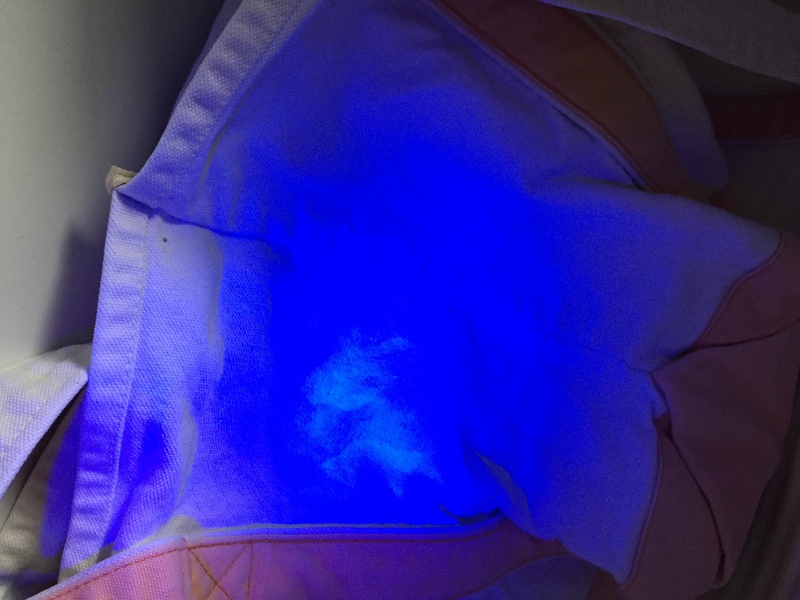 The UV blacklight is your best tool for finding all the areas that need to be treated, and for verifying that you have successfully cleaned it all up. A long wand type makes it easiest to find areas, but a small cheap light can also be used. Frequently, if the litter box is unacceptable, if the cat got locked in the laundry room, or she has a UTI and has come to associate the litter box with pain, your cat will pick soft items, such as a pile or basket of fresh laundry as the place to go. While annoying, this is good, as these are some of the easiest things to get properly cleaned. 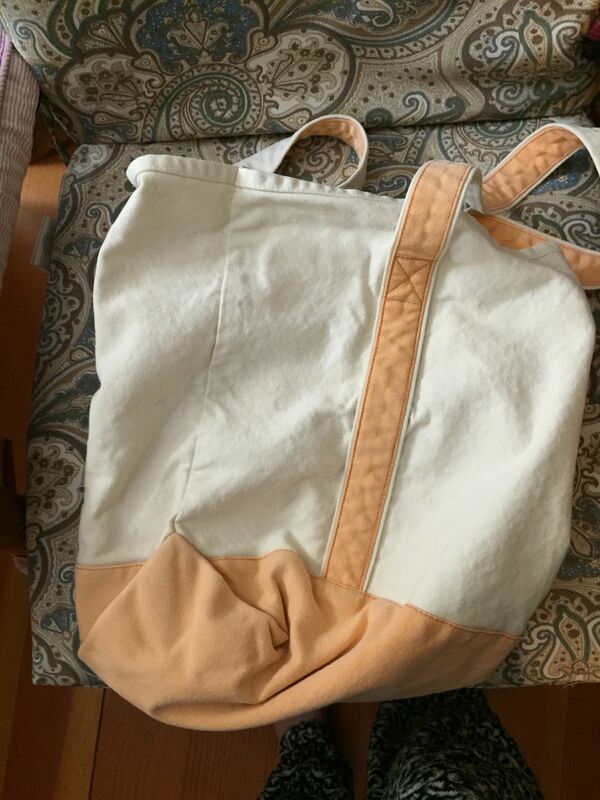 Above, you can see a canvas bag that was targeted and sprayed by my male cat when our son was born, and again when we moved. The first picture is with natural light. It looks fine, but under the blacklight, you can clearly see the spots where it had been sprayed. This was a tough case, as it had been sprayed multiple times, over the course of 7 months and then sat for a few more before I got around to doing anything with it. 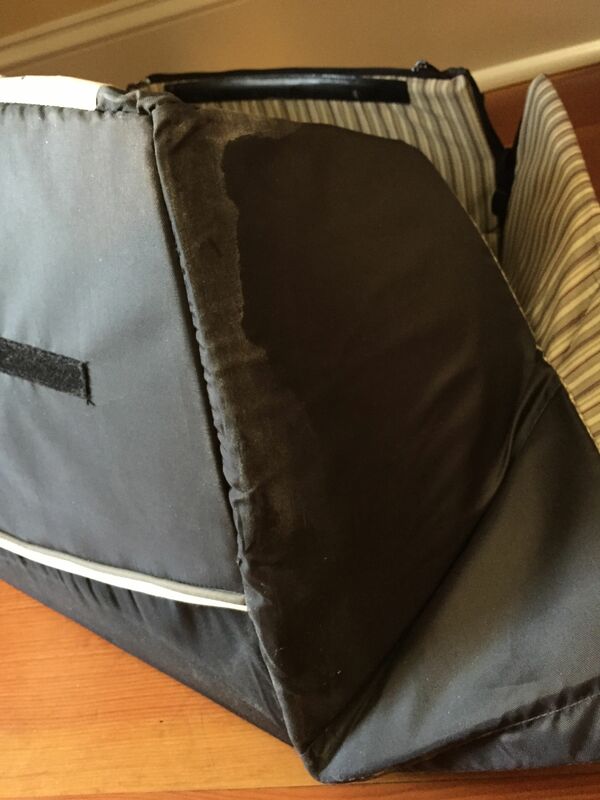 I also suspect he may have sprayed this bag before then, when he had a UTI. The first thing that I did to clean it was to toss it in with our son’s dirty diapers. It went through the prewash and the main wash, but I didn’t put it through the dryer. If you’re not washing dirty diapers, any hot, heavy duty wash cycle with a generous amount of strong detergent, and enough other laundry for good agitation will do. 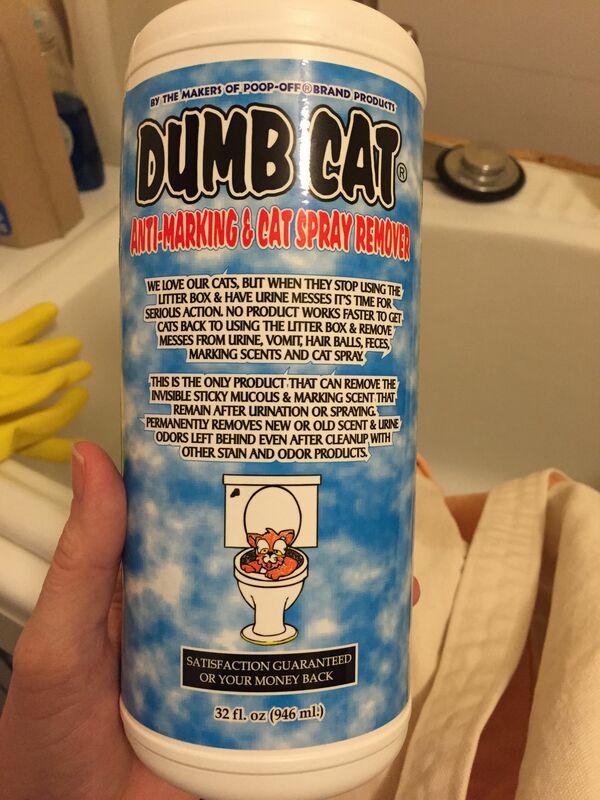 Then, I sprayed all the spots that glowed under the blacklight with the Dumb Cat enzyme spray, and according to its instructions, let it sit for 5 days, then ran it through another diaper wash. At this point, it looked and smelled completely clean, to my human nose. As you can see, a small area has still visible urine, if the room is darkened. I sprayed it again. 5 days and another diaper wash ought to do it this time. If it comes clean under the UV light, I will let it go into the dryer and call it clean. If you have any lingering odor of ammonia, a bleach soak will neutralize it. 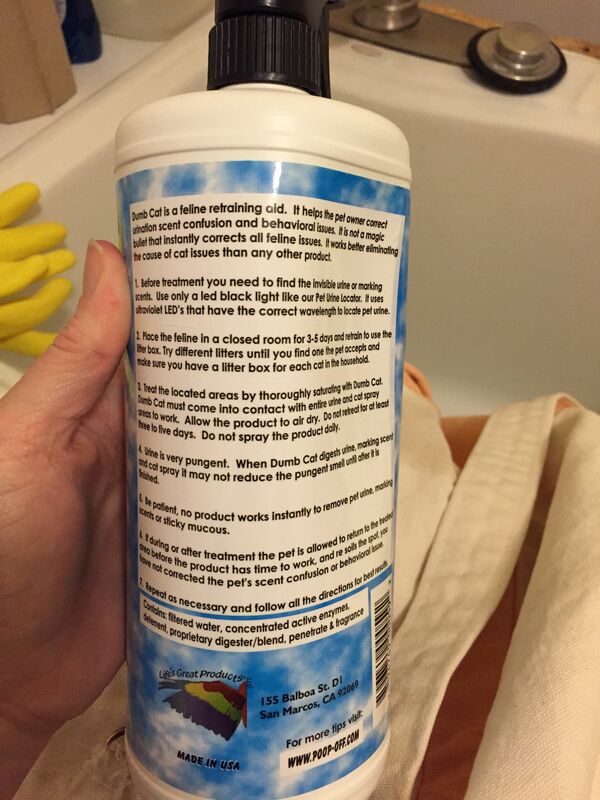 You can follow these instructions, as long as you don’t have iron hard water. 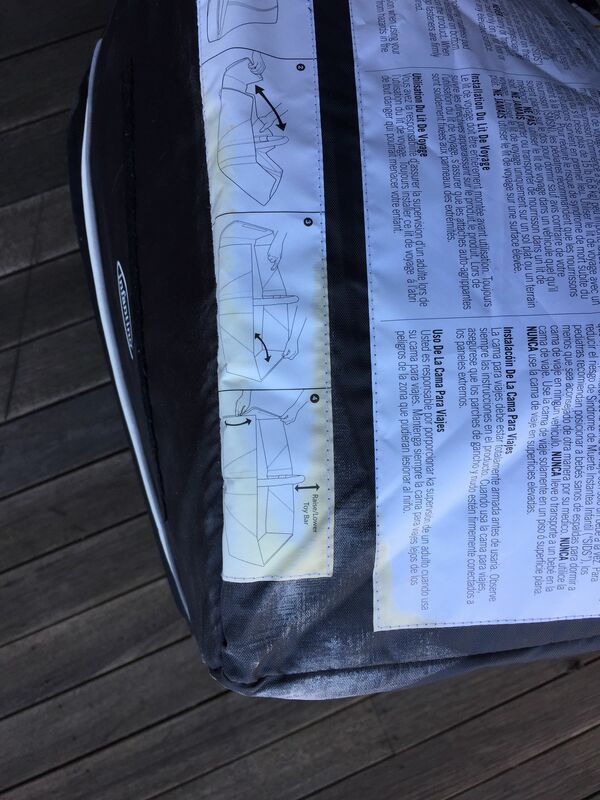 For large bulky items, the procedure is more or less the same as for washables, except of course, you can’t put a mattress through the wash. You’ll want to treat these items immediately. Blot up all of the liquid you can. If you have a carpet cleaner with an upholstery attachment, you can use that, otherwise spray and blot with an upholstery cleaner that is safe for your fabric. You can test it on an inconspicuous area first if you’re not sure. Then spray with the enzyme cleaner and let it sit for several days. 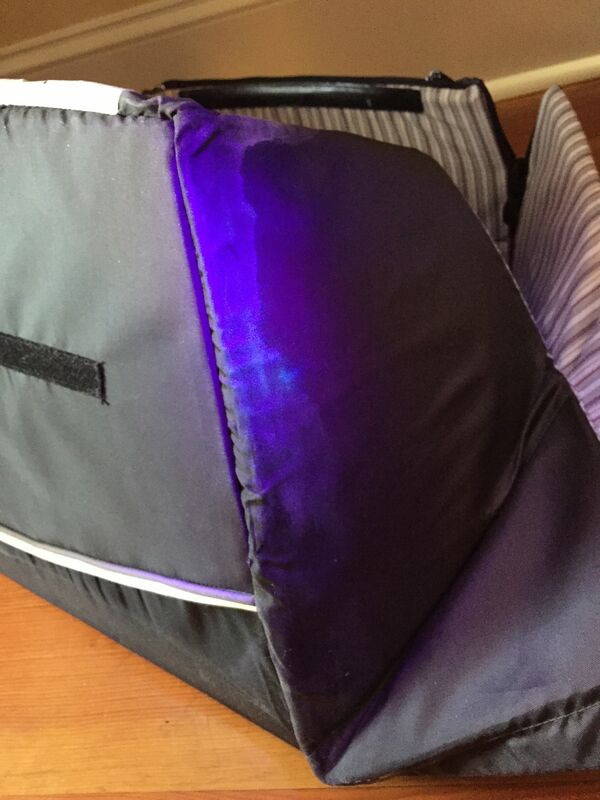 Recheck with the black light, and repeat until it shows clean. Hard surfaces are easy. Mop or wipe up the urine as usual, and apply an enzyme spray and let dry. 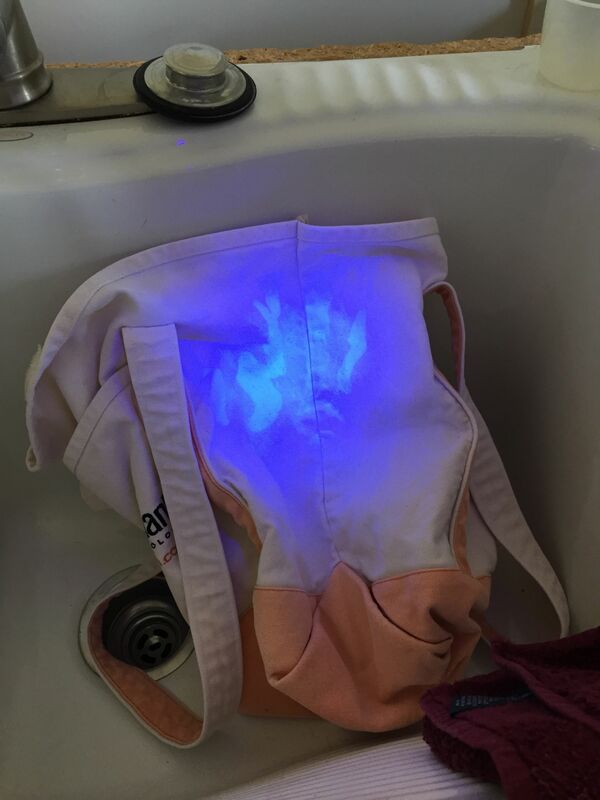 Use the UV lamp to validate that you successfully removed it all. Items that can be soaked in a deep clean can be cleaned that way, with the addition of either spraying the affected area, or adding an enzyme booster designed for laundry to the water. Nature’s Miracle and Odoban make concentrate versions designed to be diluted with laundry. Use the amount recommended for a normal sized load. For items that cannot be submerged, you can simply spray the ready-to-use enzyme spray to saturate the affected area(s) and leave in the sun for a few days. Be careful, as the sun may bleach colored items. 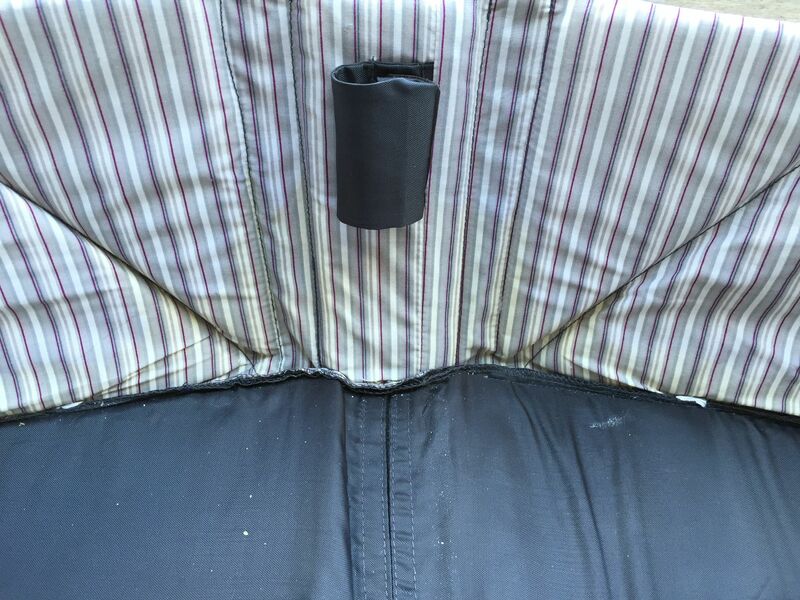 These are before pictures from a portable infant bassinet that was chosen as an alternate litter box once and identified quickly. After being sprayed and sitting out in the sunshine on the porch for a week, the only remaining trace to be found was this one. One more spray and some more sunshine and it should be completely clean again.